In this episode of the Brand Focus Podcast, Host Antoine Woods Jr. begins a 2 part series on “How to prepare for launching your brand”. 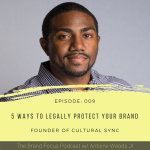 In part 1, which covers the “internal launch”, he provides “5 ways to launch your brand internally” and speaks on why a successful internal launch ignites the success of your external launch. 6:19 1st way – Aligning your brand from the top, down. 7:48 2nd way – Hiring & performance review processes.